The combination of high mountains, large mountain glaciers, and a North Atlantic climate with thaw/freeze cycles and abundant precipitation has created a plethora of Icelandic waterfalls. There are over 100, a few of which consists of rows of waterfalls! Some are unnamed. There are towns and villages where the sound of water tumbling down the mountains is an ever-present signature tune. The people of Seyðisfjörður fall asleep and awaken to the cacophony of multiple cascades, some gently falling, others tumbling and babbling energetically down from the high mountains which surround the town. Each spring and summer meltwater from the mountains increases the speed and volume of these falls markedly. Some are wonderfully and descriptively named such as Gufufoss (Steam Falls). The spray generated really does give the appearance of steam. The World of Waterfalls top 10 list actually includes two Iceland waterfalls: Gullfoss waterfall on the Hvítá river (the White River) in Haukadalur, South Iceland, on the very popular Golden Circle tour route; and Dettifoss, on Jökulsá á fjöllum (Mountain Glacier River) at Jökulsárgljúfur, Vatnajökull National Park in North East Iceland. Sir Ridley Scott’s film, Prometheus, was filmed here. Dettifoss, a musical composition by Jón Leifs was, not surprisingly, inspired by this waterfall! Getting two waterfalls listed says a lot about the majesty of Icelandic waterfalls. This really is a pretty awesome achievement for such a small country! The south shore area of Iceland has some waterfalls which are very popular tour destinations, so these waterfalls are now particularly well-known! Seljalandsfoss on the Seljalands River, close to Highway 1 and the road to Þórsmörk, flows down from Eyjafjalljökull (Island Mountain Glacier). 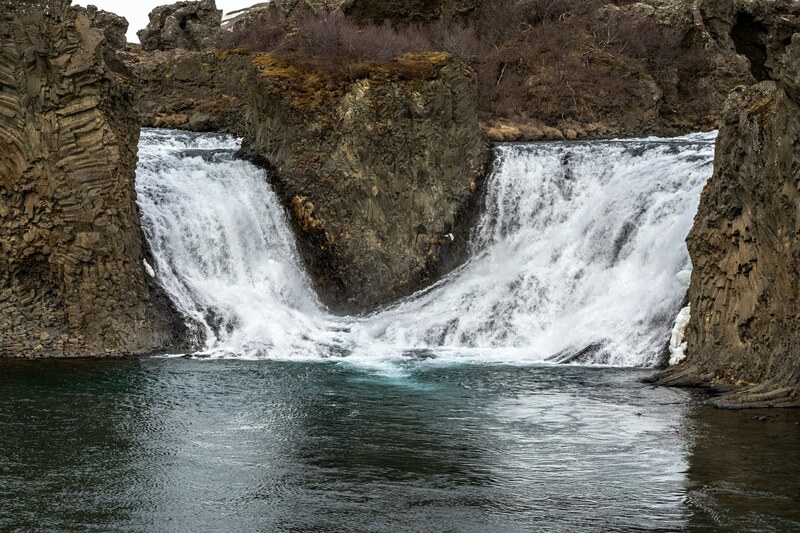 This Icelandic waterfall has a unique claim to fame, as it is possible to walk behind the gracefully falling 60 m high cascade. Skógafoss is another south coast waterfall, situated on the Skógá river in the south of Iceland. Here the falls actually drop down the former sea cliffs. This powerful 25 m wide cascade falls 60 m generating clouds of spray, and on sunny days a single or double rainbow can usually be seen. Skógafoss has made a few appearances on the silver screen. Some well-known movie scenes were shot here including Thor: The Dark World and The Secret Life of Walter Mitty. There is also a famous legend about the first Viking settler in this area, Þrasis Þórólfsson. He is said to have buried a treasure chest filled with gold behind Skógafoss, which so far no one has succeeded in recovering! Goðafoss waterfall at Bárðardalur, North Iceland can certainly claim to be one of the most famous waterfalls in Iceland. This is on Skajálfandafljót, a river which runs all the way from Sprengisandur in the Highlands before dropping through the 30 m wide and 12 m high falls in a dramatic but supremely graceful cascade. Although this waterfall is neither high nor especially powerful by Icelandic standards, the amazing geological formations in the area add greatly to the atmosphere. However, Goðafoss has more than one claim to fame. An Icelandic Saga recorded in Ari Þorgilsson´s Íslendingabók (The Book of Icelanders) tells how in 999 or 1000 CE, the Law Speaker, Þorgeir Ljósvetningagoði threw his Pagan idols into Goðafoss. Kirkjufellsfoss waterfall (Church Mountain Falls) is situated on the Kirkjufellsá river at Grundafjörður on Snæfellsnes in West Iceland. These small falls are reputed to be amongst the most charming and beautiful waterfalls in Iceland, not undeservedly so! The graceful and highly photogenic falls have featured in many paintings, photographs, prints and postcards over the years. A little-known waterfall can sometimes become an overnight social media star, as happened with Brúarfoss in South Iceland. When a waterfall suddenly attracts a large volume of vehicles and foot traffic this is going to be problematic for the environment. It is not only the car parking facilities which become overwhelmed, footpaths are inadequate and possibly too poorly defined. If these natural beauties are to be maintained for future generations it is very important that people are considerate. It does, unfortunately, not take ever so many footsteps in the wrong place to create erosion and damage to a fragile ecosystem. So visitors are politely requested to tread lightly upon the earth! Dettifoss in North Iceland is the most powerful waterfall in Iceland, and it is also reputed to be the most powerful in Europe with an average flow rate of 193 m3/s. The power of a waterfall is determined by multiplying its flow rate by the distance of its drop. These falls are a colossal 100 m wide and the thundering cascade crashes through a 44 m drop. The Jökulsá á Fjöllum river originates from the mighty Vatnajökull glacier, collecting an enormous volume of discharge water on its journey to Dettifoss. The river picks up a lot of sediment which gives these falls their characteristic pale gray color. Hafragilsfoss waterfall is considered to be the second most powerful Icelandic waterfall. These falls are also located on the awesomely powerful Jökulsá á Fjöllum river, just a little downstream from Dettifoss, where the canyon is at its deepest. The booming thunder as the magnificent cascade drops 27 m through the 91 m wide falls can be heard over a considerable distance, with the spray surrounding the falls with clouds of mist. Urriðafoss on the Þjórsá river, close to the coast and Highway 1 in South Iceland takes 3rd place! 4th place goes once again to a waterfall located on the Jökulsá á Fjöllum river, Selfoss, in North East Iceland. Although the 4th place contender, there is still, in the eyes of most visitors, an almost unimaginably powerful volume of water cascading through these falls. If you want to stay dry do not stand downwind or at all close, as these falls produce a dramatic volume of spray. To give a sense of perspective as to flow, on the World of Waterfalls’ most powerful list these Icelandic waterfalls occupy places between 25th and 37th worldwide. Selfoss is accessible and very close to Dettifoss in the Jökulsárgljúfur preservation area in Vatnajökull National Park. Are there any new waterfalls in Iceland? Yes, there are. It is perfectly possible for glacier retreat/melting to reveal new waterfalls, so with global warming generating glacial melt this is a phenomenon we will probably see more of. In 2007, the retreat of Morsárjökull, an outlet glacier of Vatnajökull revealed Morsárfoss waterfall, near Kristínatindar, South East Iceland. 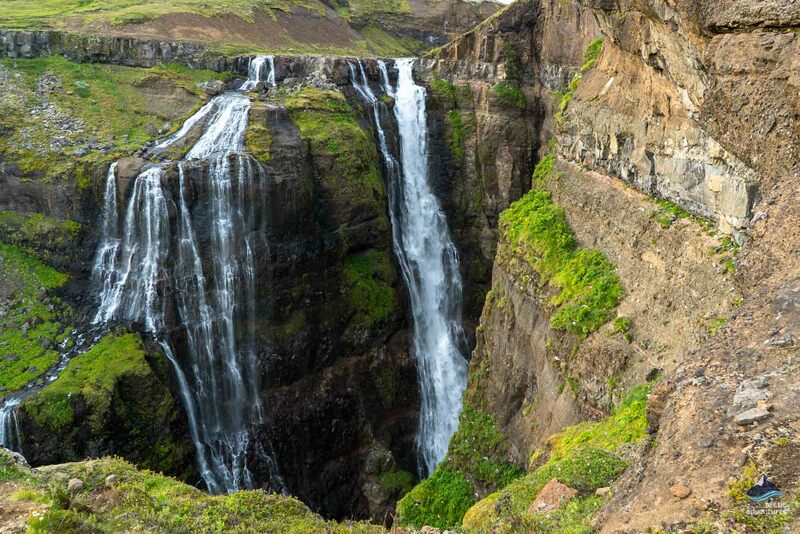 In 2011, one of the cascades was measured at 240 m high, making it the highest waterfall in Iceland. The above mentioned Morsárfoss is the highest by a margin of around 42 m. Glymur Fossinn (The Glymur Waterfall) on the Botnsá river at Botnsdalur on Hvalfjörður has a 198 m drop and claims second place. This waterfall is in an exceptionally peaceful and beautifully lush forested area with high mountains. Berries grow abundantly in the summer and early autumn. The Glymur Waterfall Hike tour from Reykjavík will show you the falls and the stunningly beautiful unforgettable landscapes around the canyon. Stigafoss on the Stigá river near the the southern tip of the Öræfajökull Volcano between Skaftafell and Jökulsárlón is the third highest waterfall. The falls drop in two stages through 137 m. The Stigá river originates from Stigárjökull glacier, a tongue of Vatnajökull glacier. This seldom mentioned waterfall is very difficult to access. It is, though, possible to view part of the falls from Highway 1 (the ring road). The Hengifoss waterfall (Hanging Falls) drops an elegant 128 m into the magnificent gorge below. The falls are located on the Hengifossá river in Fljótsdalshreppur, East Iceland. It is well worth making the 40 to 60 minute hike each way from the car park to view Hengifoss. There is more to the majesty of a waterfall than its power or depth of drop – the scenery around this waterfall will leave you feeling you have walked into a magic land. The narrow falls tumble down a colorful stepped cliff face, where unusual red strata patterns reveal the layers left from volcanic eruptions during the time when Iceland was being formed. Háifoss waterfall (High Falls) on the Fossá river, a tributary of the Þjorsá river, drop from a height of 122 m. There are hiking paths which lead to these falls from both directions, one of which begins at Þjóðveldisbærinn Stöng, the Viking Age farm which was destroyed by the 1104 eruption of the nearby Hekla Volcano. The farm has been excavated and reconstructed giving, more than 900 years later, a fascinating insight into life during this period. 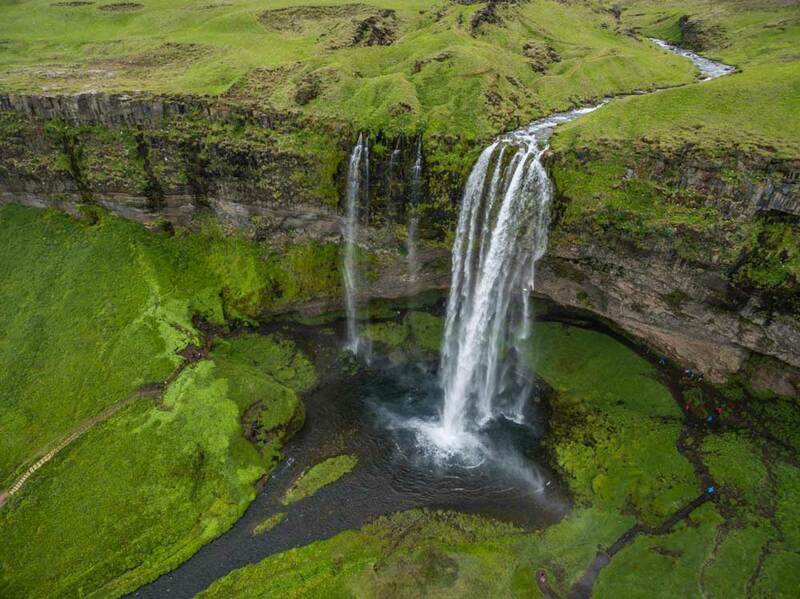 The name, Háifoss, often leads people to conclude that this must be the highest waterfall in Iceland. It is actually in 5th place, but is no less beautiful for that! With so many sources of geothermally heated water, it is not surprising that Iceland has some hot rivers and waterfalls. On a Family Rafting Adventure tour good use is made of a hot waterfall on the Jökulsá river – hot chocolate is made straight from nature´s own kettle! Do you want to take a warm shower out in raw nature? You have got to try this at the pool beneath Heitur Foss (Hot Falls) in Jökulsdalsheiði, Laugarvallardalur, near the Dimmugljúfur canyon in East Iceland. The Varmá (Warm River) tumbles through some quite small waterfalls as it runs through Hveragerði. In some places, particularly close to the Frost and Fire Hotel, clouds of steam can be seen rising ethereally from the surface of the water! Hveragerði is within the highly geothermally active Hengill Volcano area. Álafoss is a charming small waterfall on the river Varmá in Mosfellsbær, a delightful country town within the greater Reykjavík area. So you have no transport, no problem! Just take a number 6 or 15 Strætó to Mosfellsbær from the city and you will be there in no time – enjoy the coast and mountain scenery on the way over, and get off at Háholt. The power of this river was put to good use when the Álafoss Wool Factory established its operations here. Nowadays, the old factory building houses the Álafoss Shop which sells top quality Icelandic wool, woolen goods, and Icelandic souvenirs. The falls are situated just behind the shop, and they are particularly magical after a fall of snow. Aldeyjarfoss waterfall is set within the most extraordinary natural amphitheater of basalt columns which are part of the Suðurárhraun lava field. As the Skjáflandarfljót river drops down from a height of 20 m, shimmering white water contrasts starkly against the dramatic black basalt surroundings. Aldeyjarfoss falls are often said to be the best waterfall on the Skjáflandarfljót river, and well worth visiting even though they are a little off the beaten-track. They are within the Icelandic Highlands, close to the northern part of the Sprengisandur mountain road (F 26). Barnafoss waterfall (Children´s Falls) used to also be known as Bjarnafoss. It is situated on the Hvítá (White River) in Borgarfjörður about 95 km from Reykjavík. There is another Barnafoss in the north which can make things a little confusing! These falls are both wide and dramatic, as many cascades of tumbling white water pour over dramatic black basalt. There are hiking paths and many viewing points. A few legends are associated with these falls, the most famous of which determined their name. The parents of two boys went with their ploughman to church at Gilbakka í Hvítarsíðu. Instead of remaining at home as they had been instructed to do, the two boys decided to find their parents. They took a shortcut across a natural stone bridge above the waterfall but lost their balance and fell into the fast flowing river and drowned. Their distraught mother put a spell on the bridge, decreeing that anyone else who tried to cross it would also drown. It is said that shortly after this the bridge was destroyed by an earthquake. Hjálparfoss waterfall is a strong but serene double waterfall situated where the Þjórsá and Fossá rivers meet to the north of the Hekla stratovolcano. 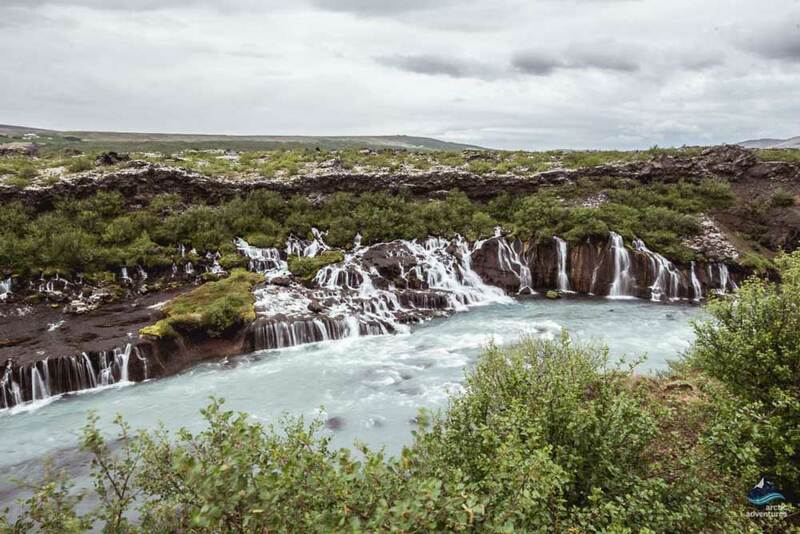 Hjálparfoss means ‘helping falls´ which in the circumstances is a highly applicable name. Since settlement times people have traversed the ancient ancient Sprengisandur road through the barren highlands. These historic travelers would always be greatly relieved to arrive at the lush highland oasis at Hjálparfoss in Þjórsárdalur. Now their horses could rest, graze on fresh grass and recover their strength for the next leg of the journey. Hrafnabjargafoss is situated on the Skjálfandafljót river not very far south of Goðafoss. This is sometimes described as a hidden jewel of a waterfall because it receives less attention than other better known waterfalls in the area. If you prefer to appreciate a waterfall in solitude well away from crowds, take the mountain road (F 26) to Hrafnabjargafoss! 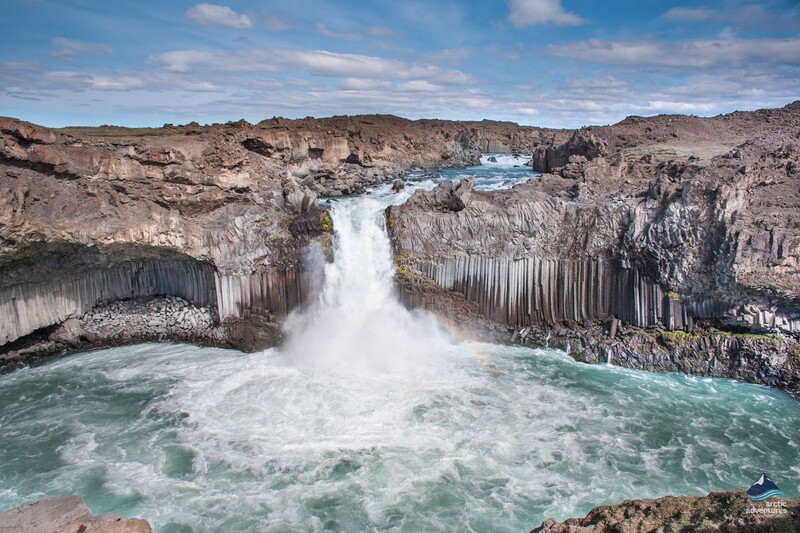 You will be rewarded with a majestic series of spectacular white-water torrents rushing powerfully over black vertical and bent basalt columnar formations. In sunshine or beneath a leaden gray sky this is an extraordinary sight. Hraunafossar waterfalls (Lava Falls) in Borgarfjörður are a stunning collection of hundreds of cascades. These gush, babble and tumble over the dramatic black and sometimes green moss cloaked lava from which they emerge. These falls are not high but they extend over a very wide area, while the nearby pathways offer excellent viewing and photo opportunities. The falls result from a very unusual and beautiful natural phenomena. Rivulets of water have streamed through porous lava all the way from the Hallmundarhraun lava field beneath Langjökull. 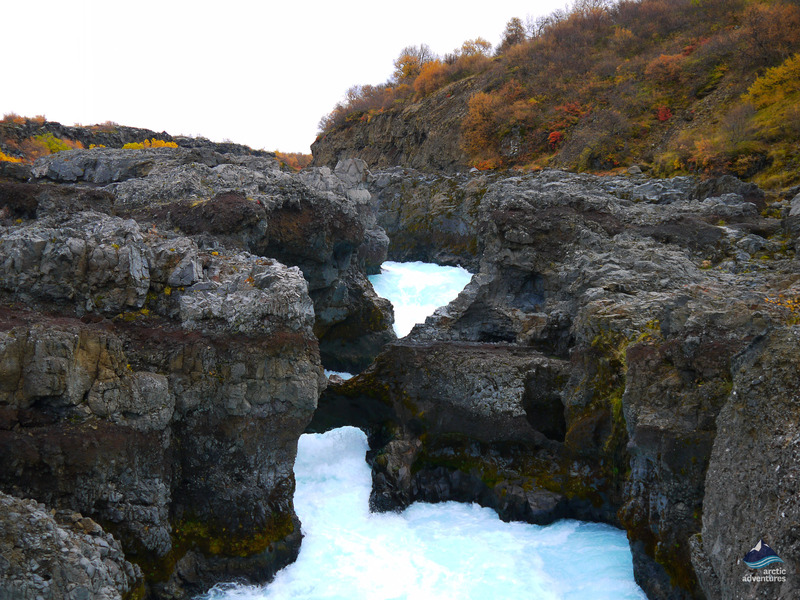 These ‘hidden’ torrents then emerge from the less porous lava in hundreds of little streams, coalescing into the falls at Hraunfossar before draining into the Hvítá river. Litlanesfoss waterfall is a stunning narrow towering cascade which is framed by massive but exceptionally beautiful hexagonal basalt columns. It is situated to the south west of Egilsstaðir, close to the southern end of lake Lagarfljót on the Hengifossá river about 1.5 km from Hengifoss waterfall. 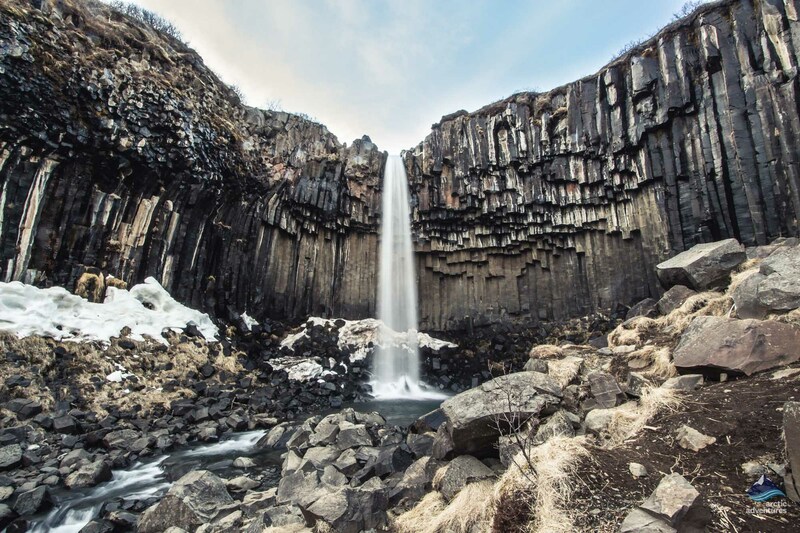 Svartifoss (Black Falls), situated at Skaftafell, is one of the most popular waterfalls in Vatnajökull National Park. The name of this waterfall has clearly been influenced by the stark and brooding black basalt columns which surround it. Clusters of these columns of varying lengths ‘hang’ out from the cliff top, making it look top-heavy and pushing the cascade outwards a little as it drops through 25 m. The base of the waterfall is surrounded by jagged rocks, hexagonal columnar formations such as these are particularly prone to snapping off. Architects have often taken inspiration from the natural forms around Svartifoss. This influence can clearly be seen in the shape of Reykjavík´s Lutheran Parish Church, Hallgrímskirkja. However, the architect, Guðjón Samúelsson, obviously had a sense of humor as in sharp contrast to the blackness of Svartifoss the Hallgrímskirkja is white! These waterfalls have been listed in alphabetical order for a reason. In the opinion of the writer, although they each offer something very different, in terms of beauty they are equal! The relationship between groups who feel Iceland’s magnificent waterfalls should be altered as little as possible and the hydroelectricity industry has been an extremely uneasy one. The generating potential inherent within the mighty Icelandic rivers is enormous and many people, particularly large overseas corporations, see these rivers simply as a latent resource waiting to be exploited. However, the utilization of this potential cannot happen without consequences. The required dams, reservoirs and other constructions radically alter both landscapes and the manner in which a river will flow and will change or destroy waterfalls. Several hydroelectricity power plants have been built in Iceland, the largest of which is Kárahnjúkavirkjun, the giant hydropower plant in Fljótsdalshérað, East Iceland. This plant has an installed capacity of 690 megawatts. Kárahnjúkavirkjun was built to produce an enormous 4,600 gigawatt hours per annum of electricity for the Fjarðaál Alcoa aluminum smelter at Reyðarfjörður, 75 km to the east. The expansion of the aluminum industry in Iceland is another environmental concern that has generated strong feelings in the hearts of the Icelandic people. Proposed aluminum smelters and the giant power plants required to fuel them are always controversial and strongly protested against. Of course, there are economic arguments in favor, however, the sustainability of these arguments is reliant upon the market price of aluminum. Industries, which have traditionally been big users of aluminum, are increasingly turning to new materials for some of their operations. Those who oppose the economic arguments, therefore, often do so from an economic point of view, not purely from the perspective of the value they place upon the beauty of Icelandic nature. Can it really be good to place so many of the nation´s economic eggs in one basket? This is a question which is often raised by the groups and individuals who oppose these developments. That the aluminum is produced by foreign companies for industries which operate solely overseas is particularly irksome to most Icelanders. So, what kind of environmental changes did the building of Kárahnjúkavirkjun create? There were great changes to the landscape almost up to Mount Kárahnjúka, the mountain the power plant is named after. The Jökulsá á Dal and Jökulsá í Fljótsdal rivers, which have their origin in the northern part of Vatnajökull glacier, were dammed with five giant concrete faced embankment dams, inflicting dramatic scars on some of the most spectacular natural areas in the world. Kárahnjúkastífla on Jökulsá á Dal is the largest dam of its type in Europe at a massive 193 m high and 73 m long, while the Desjarástífla and Sauðárdalsstífla dams on this river are not quite so large. On Jökulsá í Fljótsdal the Kelduárstífla and Ufsarstífla dams create the Kelduárlón Reservoir and the Ufsarlón Pond. Water is then conveyed from the two reservoirs through underground tunnels to the hydroelectric plant. Some environmental consequences are immediate and others develop or increase over time. Huge expanses of land were flooded beneath the reservoirs including, among many other priceless pearls of nature, the magnificent Hafrahvammagljúfur canyon. Innumerable waterfalls and other natural features were submerged forever. The man-made Hálslón Pond has reduced the flow rate of the Jökulsá á Dal river below the dam from 205 m3/s to just 95 m3/s. Previously this river would transport an enormous volume of sediment out into the North Atlantic Ocean. This sediment heavy water now discharges into Lagarfljót lake. The large volume of glacial sediment from Vatnajökull glacier which is now deposited in the lake does not only make the water cloudy, it impacts upon the ecosystems within and around the lake. Adjacent areas with valuable relics, farmlands and precious bird habitats continue to be negatively affected and very often cumulatively harmed by these changes. So how come Kárahnjúkavirkjun was built at all? This kind of power plant project involving overseas companies was first proposed around 1975. Until 2002, massive opposition made certain these plans never came to fruition. In 2002, the combined might of the international giant, Alcoa, the Government of Iceland and Landsvirkjun succeeded. There was huge opposition both from the Icelandic people and international environmental groups. Much has been done to raise international environmental consciousness concerning the issues around Kárahnjúkavirkjun. The power plant has featured in a couple of documentaries, including Mega Structures on the National Geographic Channel and Extreme Engineering on the Discovery Channel. In 2006, Sigur Rós played at a protest concert and also mentioned the plant in his iconic documentary, Heima. The Icelandic presidential candidate and passionate environmentalist, Andri Snær Magnason, very strongly criticised the building of this plant in his book Draumalandið. There is an English translation of this book and also a film entitled Dreamland! One of the loveliest Icelandic waterfalls, Sigöldafoss, a 11 m high waterfall on the Tungaá river is suffering increasing damage at the hands of the Búðarhálsvirkun hydroelectric power plant. Unfortunately, more and more of these scintillating falls are disappearing. The Búðarháls power plant, situated on the upper part of the Þjorsá river, has artificially reduced the flow volume of the Tungaá river at Sigöldulón, the reservoir above these falls. The most famous waterfall preservation disagreement of this kind relates to Gullfoss, the Golden Waterfall. A statue of Sigríður Tómasdóttir stands at Gullfoss, proudly commemorating the life of this extraordinary farmer´s daughter and environmental heroine. Her deep love for the waterfall and appreciation of its value have perhaps only been matched by that of her father before her, Tómas Tómasson. He had famously declared, “I do not sell my friends” in reply to rich and powerful men who wanted to exploit the waterfall´s hydropower potential, ruining it forever. Sigríður was born close to her beloved waterfall at Brattaholt in 1874, which remained her home until her death in 1957. On the one hand her life was one lived out in the countryside, on the other, her existence was anything but provincial. When it came to the waterfall she was a tigress who would stop at nothing to secure preservation status for Gullfoss. She rode on horseback and even walked the 120 km to Reykjavík, where she put her case before the most powerful men in the land. At one time she even promised to hurl herself into the thunderous crashing waters of the falls! Gullfoss was finally granted preservation status in 1979. The Icelandic poet, famous entrepreneur and controversial figure, Einar Benediktsson, wanted to construct a dam at Urriðafoss waterfall as part of a hydroelectricity plant as long ago as 1927. Had this plan come to fruition then these fabulous falls on the mouth of the powerful Þjórsá river, just off Highway 1 on South Iceland would have been destroyed forever. This river is the longest in Iceland. Having flowed from the highlands through the lowlands, it is at its most voluminous at Urriðafoss. As long ago as 1914, Einar founded Fossafélagið Títan (The Titan Waterfall Company) with the intention of building hydroelectric plants. His enthusiasm sometimes even found its way into his poetry! This company purchased certain rights but was (thankfully) unable to obtain satisfactory financial backing to fulfill its intentions. 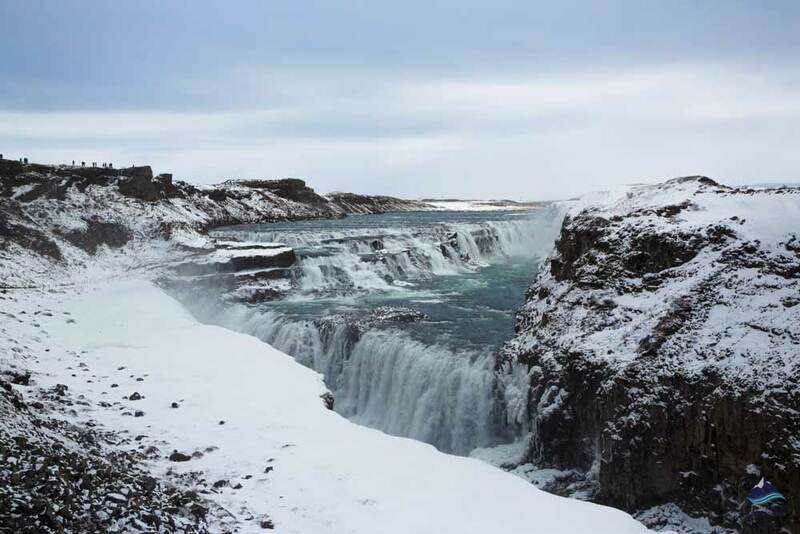 Over the years there have been various attempts to get plans for a hydroelectric power plant at Urriðafoss and all, in the face of enormous protests, were rejected. However, this is certainly a continuing battle! In 2014 the majority of the Icelandic Parliament, Alþingi’s Industrial Affairs Committee (AIAC) announced the intention to recategorize eight areas as utilizable options for future hydropower plants. These areas were currently considered to be preservation areas or areas which were on standby. Recategorization of these eight areas, which include Urriðafoss within the Master Plan would be the first legal step towards construction. Not surprisingly, a massive political, environmental group opposition plan was set in motion. Landvernd, the national non-government environment association based in Reykjavík released a statement alleging the AIAC’s majority goes against the main goals and intentions of the Master Plan. It was further alleged that five of the eight proposals were not processed in a manner which accorded with proper legal processes. This debate will generate polarized opinions and white-hot emotions for years to come!